to take a closer look. that she had ever seen! stay beyond a wanting grasp. This entry was posted in cats, Humor, photography, Poetry, wildlife and tagged animals, Pets, squirrels. Bookmark the permalink. Thanks Cindy! That little female squirrel used to come every morning to see him (she was always looking at him and not the other female cat). The squirrel would sometimes stand up and tap on the glass. I’m not exactly sure what was going on, but she actually did seem to be interested in our large male seal point Siamese cat. After a while, my cats expected her to come by. Then one day, she didn’t come back. I don’t know what happened. I hope she didn’t get hurt or something. Her behavior was really rather cute! Yes..A very interesting love triangle…or something like that! Sometimes it is better not to open the door. I like your concluding thoughts, along with the photo of “squirrel tail” grass! 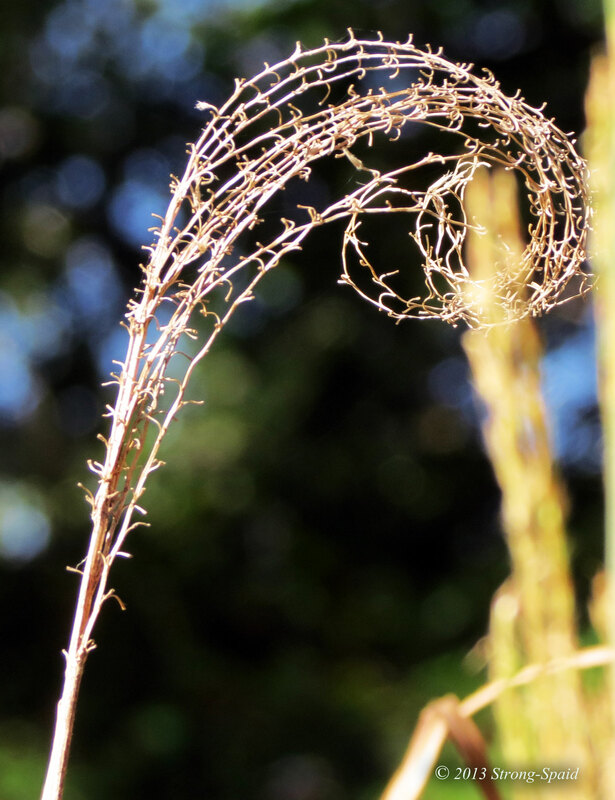 Marso….I thought it looked a wee bit like squirrel tail grass too! I am not sure what it is. this is so cute. 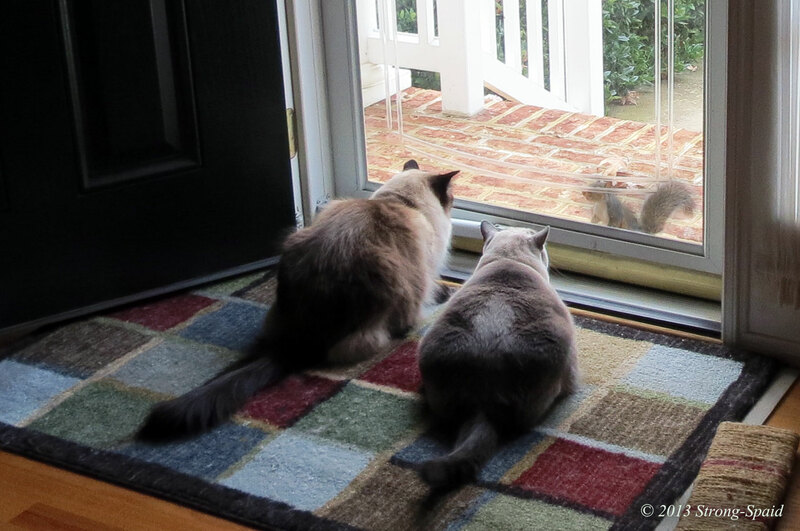 especially that the squirrel intentionally came back to visit!…my cat does this all the time, watch what goes on outside! Yes, cats love to sit and watch…. even the leaves blowing around in the yard provide hours of cat entertainment! Oh, this is good. This is very very good! Thanks! I see you agree….. There are some dreams that shouldn’t be followed! Love these, words, pictures, thoughts, ending…Nicely done! A little slow getting back with my reply. Out in the yard raking leaves, at the same time more of them are hitting me in the head. And back out I go…again…. Most definitely goes that way for humans. Sometimes, when a door is shut, there is a reason. Apologize for my slow response. I’ve been overwhelmed by falling leaves…raking and raking and raking. I think my female cat would have loved to get her paws on that wayward squirrel. Our male cat is more laid-back. He was more than happy to sit back and watch all of the squirrel dancing. This was great! I loved it! I don’t know about you but I am being buried by falling leaves. We have taken about 90 bags of leaves out of our yard so far…..which is why I haven’t been writing much. Raking and bagging leaves has been taking up all of my time! Thanks Kavita! I think many of us can relate to this sort of situation. Some relationships are better when they never happen! Awwww, so cute! What a wonderful little squirrel and what sneaky sneaky cats.. Thanks! I have been out in my yard for the past couple of days raking and raking leaves. Kind of strange…..I haven’t seen any squirrels around! Not many acorns fell from the trees this year, so maybe they moved on to better nut hunting ground. Beautiful cats, and such an inquisitive squirrel. I love it! Thank goodness for glass doors that save us from ourselves. 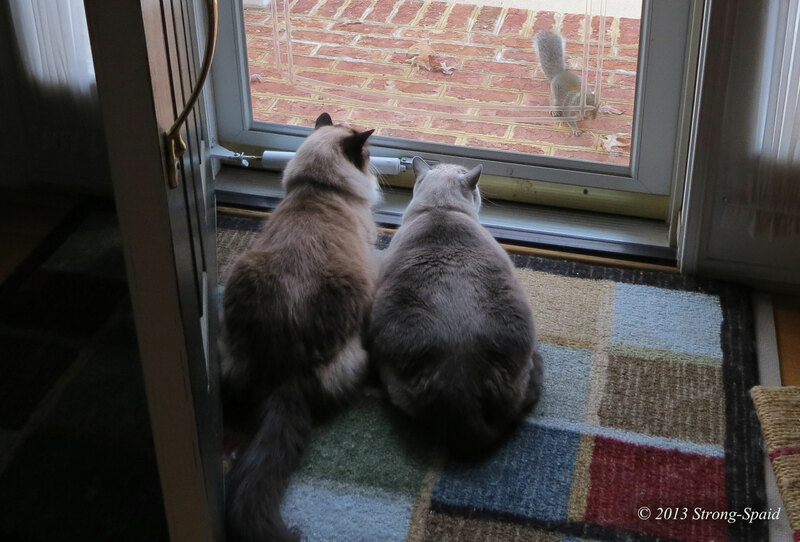 We often throw bird seed and “critter food” out back, so that our cats will have lots of bird, squirrel, and deer entertainment. They’ll sit for hours….just watching…(and dreaming, I suppose). sometimes dreams should be left as dreams! And wisdom is knowing when to let that happen!